JTA reader Agustín checks in with his latest Florida find. 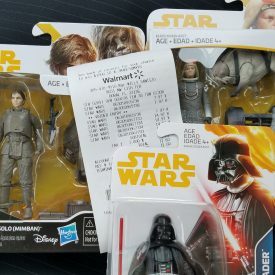 He found the latest wave of Solo basic figures and two-packs at his local Doral, FL Walmart. ← Unpopular Opinion: Everything is Fine Here, How Are You? You saw our recap of The Clone Wars [Blue] line yesterday. Let’s take a look at what was offered in The Clone Wars [Red] line. Now that THE CLONE WARS television show is back, we hope that these posts can inspire both Hasbro to get the creative juices flowing again and get out some of their greatest hits from years’ past in addition to tooling new characters they never got to yet (even the cancelled ones). Please click through to check out The Clone Wars [Red] line that ran from 2009 through 2010. Links for Research Droids Reviews and Visual Guides are provided. And if you don’t see the RDR button, it just means that we only have the review and not the Visual Guide to that item. Enjoy! We’re locking the comments on THIS article, so feel free to relive your memories in the actual review pages. THANK YOU! 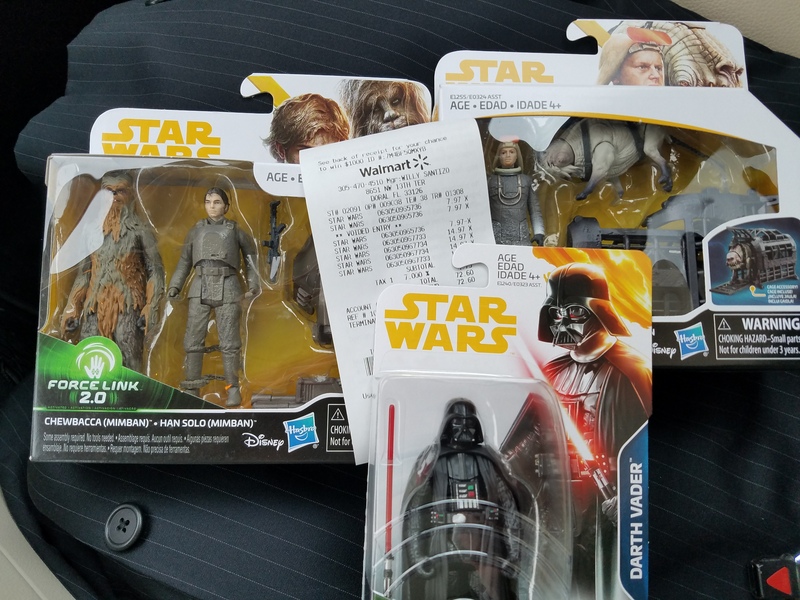 JTA reader vikingrobot’s father found the new Star Wars [Solo] Two-Packs at a Walmart in Clearwater, Florida on clearance. Also, JTA reader and friend Russ T. sends us an image of the brand new Princess Leia (Hoth) Force Link 2.0 figure on clearance as wel. His store just got these too. Retail has no idea which end is up. Today’s Visual Guide update takes a look at the Chewbacca (Mimban)/Han Solo (Mimban) two-pack set from the Star Wars [Solo] line. Click below to check out our full guide page, and make sure to also check out our full review of this set right here. It is time to check out the Chewbacca (Mimban)/Han Solo (Mimban) Two-Packs set. Learn more about it in our Research Droids Reviews today! Be sure to leave your thoughts in our comments section, vote in the poll or even comment about it on our Facebook page. Click the banner below for the direct link to the review! As always, you can also send your review requests via email if you’d like to see something that we didn’t cover yet. ← Pre-order TBS6 [P3] Clone Commander Wolffe At GameStop! We have new product to look at now! It is time to check out the Rebolt/Corellian Hound Two-Packs set. Learn more about it in our Research Droids Reviews today! Be sure to leave your thoughts in our comments section, vote in the poll or even comment about it on our Facebook page. Click the banner below for the direct link to the review! As always, you can also send your review requests via email if you’d like to see something that we didn’t cover yet. ← Mark Hamill About Star Wars: "Hope For The Best, But Expect The Worst"
The next two-pack from Star Wars [Solo] features the Kessel Guard and Lando Calrissian. Click below to check out our full Visual Guide of this set. We also have a full review of this set, make sure to check that out right here. ← Yet Another New TV Spot For Solo! The Kessel Guard is one of the nicest 5POA figures we have ever seen from Hasbro. Lando isn’t too shabby either. Find out why you will probably want to secure the Kessel Guard/Lando Calrissian Two-Packs set from the Star Wars [Solo] line in our Research Droids Reviews today! Be sure to leave your thoughts in our comments section, vote in the poll or even comment about it on our Facebook page. Click the banner below for the direct link to the review! As always, you can also send your review requests via email if you’d like to see something that we didn’t cover yet. EE Exclusive Finn (FO Disguise)/Captain Phasma Two-Packs Set Shipping! The Entertainment Earth exclusive (that will be available to anyone who has an Entertainment Earth account) Finn (First Order Disguise)/Captain Phasma Two-Packs set is NOW SHIPPING! If you pre-ordered it, look for a shipping notice in your inbox! If you haven’t, order yours HERE. We’ve added a bunch of brand new Star Wars figures to our RDR database (all early pages). But there are some fantastic figures in this mix, like the Kessel Guard and Lando Calrissian. There are other great figure to check out too like Qi’ra (Corellia) and the Stormtrooper (Mimban) figure. Check them out in our Star Wars [Solo] page by clicking HERE. The Rose/BB-8/BB-9E Two-Packs set is IN STOCK at Hasbro Toy Shop. Use promo code CYBERWEEK17 code to save some money. The next Visual Guide update from the Star Wars [The Last Jedi] line is the Chirrut Îmwe/Baze Malbus two-pack. Click below to have a look at our full Visual Guide, and click here to have a look at our full review. They’re back and better than ever. Check out the Chirrut Ímwe/Baze Malbus Two-Packs set in our Research Droids Reviews today! Be sure to leave your own thoughts in our comments section, vote in the poll or even leave comments about it on our Facebook page. Click the banner below for the direct link to the review! As always, you can also send your own personal review requests via email if you’d like to see something that we didn’t cover yet. ← Hurry! Walmart Exclusive Funko Pilot Set In Stock! We have another Star Wars [The Last Jedi] Visual Guide update tonight. Click below to check out the Rose (First Order Disguise)/BB-8/BB-9E set. You can also check out our full review right here.